To say that Sterling K. Brown currently has a lot on his plate may be something of a massive understatement – hot off a scene-stealing performance in The People v. O.J. Simpson: American Crime Story, Brown secured key roles across The Predator and Marvel’s Black Panther this year. As two of the more high-profile releases of 2018, it tees up an exciting 12 months for the actor, but Sterling K. Brown has already staked a claim for another project: Green Lantern Corps. 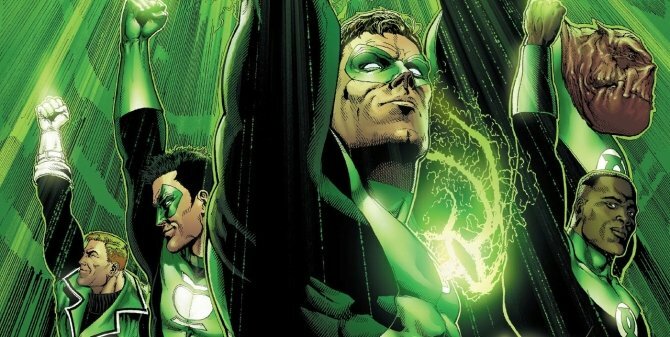 The cosmic origin story of Hal Jordan and John Stewart has made serious headway over at Warner Bros. recently, after the studio drafted in David Goyer and Justin Rhodes to pen a treatment of the script. That means WB is yet to fire up the casting process in earnest, though that hasn’t stopped the rumor mill from operating at full tilt, with reports linking Armie Hammer, James Marsden, Mahershala Ali, John Wick: Chapter 2 star Common and Trevante Rhodes, who is incidentally set to fight alongside Sterling K. Brown in The Predator, to roles in the upcoming DCEU pic. And so, when ET caught up with Brown for a recent interview, they asked the actor if he’s still interested in getting involved, after expressing a desire to play John Stewart a few months back. Turns out he is, telling the outlet that he “wouldn’t mind” taking the part. Sterling K. Brown isn’t the first – nor is he likely to be the last – actor to lobby for the Green Lantern role of John Stewart, of course, but if the Powers That Be really are listening, Brown’s enthusiasm will no doubt provide some food for thought. We’ll be keeping track of Green Lantern Corps. as the standalone pic begins to coalesce. A July 24, 2020 release date is currently locked in, but that window is subject to change depending on how quickly WB can assemble Hal Jordan, John Stewart and the rest of the spacefaring gang. As always, watch this space for more.